One of Cincinnati’s most popular neighborhoods will soon get its very own transit hub. With more than 13,000 people boarding or exiting buses every day, Northside has long been one of the region’s busiest transit hubs. This is partially due to the neighborhood’s high population and business density, but also because of the numerous transfers from the eight bus routes there (15x, 16, 17, 19, 20, 23x, 27, 51). This high transit ridership also creates an odd conversion of buses from all over the city. In an effort to clean up the operation of these bus routes, the Southwest Ohio Regional Transit Authority has long been trying to streamline and enhance operations at Knowlton’s Corner. After years of work, that vision is finally becoming reality with the $320,000 Northside Transit Center. “Northside has been working to improve bus traffic through the neighborhood for most of two decades, and the pieces are finally falling into place,” said Ollie Kroner, President of the Northside Community Council. Its location is further complimented by the nearly location of a large Cincy Red Bike Station at Hoffner Park. Cincinnati-based MSA Architects has completed its designs for the new transit hub in the heart of the Northside business district immediately south of the recently completed $15 million Gantry Apartments development. The new facility will boast dedicated bus lanes, boarding platforms, passenger shelters, bike racks and lockers, and real-time arrival technology. The plan also calls for a significant upgrade and expansion of an adjacent parking lot, which SORTA officials envision as also serving as a miniature park-and-ride facility with 18 allocated spaces. Project officials say that the Northside Transit Center project is expected to be completed by late 2017. Northside has become the center point for the city as hit-and-runs with people walking and biking have increased. In September, this even led to the community organizing public demonstrations urging City Hall to reduce the speed limit through the business district, while also committing to other safety improvements city-wide. 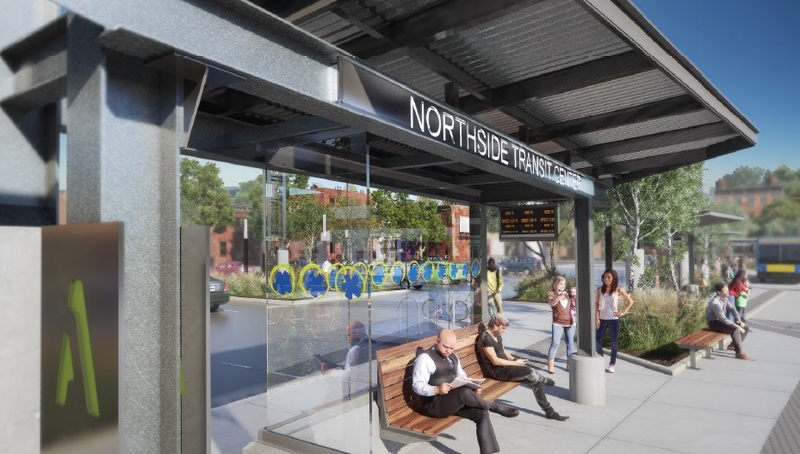 The implementation of the Northside Transit Center will significantly help consolidate bus traffic through the popular business district, while also create a safe and hospitable place for people to wait for their transit connections. While the City of Cincinnati has not committed to a Vision Zero campaign, or an official Complete Streets policy, residents continue to call for such measures. Meanwhile, the move also comes as Metro attempts to reinvent its region-wide bus system in order to better connect people with jobs. Historically, many bus systems relied on what is called a spoke-and-hub system that ran all routes to a central downtown transit center. This train of thought has changed as cities have become increasingly more mixed-use and diverse. Metro officials plan to unveil a new regional transit plan in early 2017, and may possibly put a transit tax increase before votes next November to help implement the recommendations laid out in that plan.